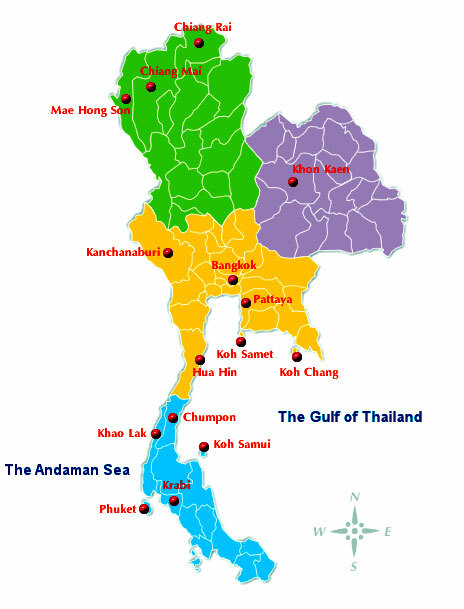 Thailand is divided into several different regions, namely North, Isaan, Central, East and South. 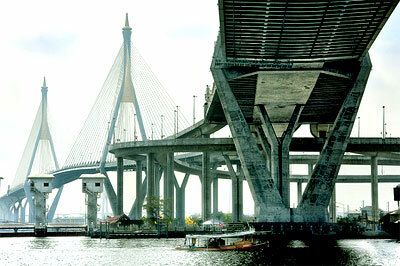 Bangkok, its bustling and frenetic capital is located in Central Thailand. Chiangmai, another popular Thailand destination is located in the North region. Other major cities in Thailand includes Ayutthaya, Chiang Rai, Hat Yai, Kanchanaburi, Nakhon Ratchasima, Pattaya and Sukhothai. Being one of Asia's largest hubs, Bangkok served almost every airline that flies to Asia. Due to that, competition has become rather stiff and prices low. International flights to Thailand cities such as Chiang Mai, Hat Yai, Ko Samui, Phuket and Pattaya are also being available. Thai Airways is the national airlines of Thailand and Bangkok Airways completing the rest of the flight routes in the nearby region not covered by Thai Airways. An example will be Ko Samui, a popular resort destination in Thailand. If you plan to book flights to Bangkok using Bangkok Airways, then the airlines actually offers free internet access for you while waiting for boarding time at the gate. If you are planning to travel on a budget and wish to book cheap flights to Thailand, then there are many low cost carriers available such as Nok Air, Tiger Airways, Jetstar Asia, Cebu Pacific, Air Asia and many more.